Looking for Skull Patches? We've got a great selection of embroidered skull patches. Iron on & Sew on skull patches for your leather jacket, vest or denim. Skull patches come in all shapes, sizes, colors and personalties. Find sugar skulls, black and white skulls, cross bones, reflective skulls. Our skull patches are very easy to apply to your clothing, if you are working with Leather or Nylon you can sew them on. Working with denim or cotton material? Then it's even easier, simply iron them on with your household iron. They'll stick given you follow our instructions. Temperature is the most important factor, you have to get the heat setting right to iron on a patch properly. We show you how, just click on a product page and scroll down some. One of the most common images associated with the biker is the skull. The Cheap Place has a fabulous range of skull patches available and today we are going to look at some of these amazing embroidered patches. Most biker's love this image and it is proudly displayed on many biker vests. There are so many ways that it can be portrayed and this category is full of some magnificent designs which are sure to delight any keen biker looking to jazz up his or her clothing. Take the "Pilot Skull Patch" for example. This superb design depicts the flaming skull of a pilot and is full of vibrant reds and browns. This wonderful iron on patch is sure to stand out from the crowd and will create a dramatic eye catching item of clothing once applied. If you want others to notice you then this patch is sure to do the job. Another attention grabbing skull patch is the "Live Free Or Die Skull Patch". This fantastic patch comes in two sizes, small or medium and shows a skull with an evil grin. With the US flag predominantly present in this image it would be a great choice for those who feel strongly about their American heritage. The stunning blue and red colors on this patch will ensure that wherever you go, you are sure to turn heads. In keeping with the theme of American patriotism, there is also a patch which depicts an American flag bandana wearing skull with wings and crossbones. This patch looks fierce and will stop traffic with its intimidating design. The snarling skull on this "American Skull Patch" will let people know not to mess with you. The red tipped wings on this patch spread to give it an impressive size of 12 x 12 inches so it will look fantastic on the back of your jacket. If you are looking for a true work of art on your clothing then you should really check out the "Mohawk Skull Patch". This remarkable patch has been designed to show a menacing skull with a Mohawk. This lifelike picture looks truly amazing when set against dark clothing and the thick die cut borders which surrounds this superb patch give it a cleaner more professional finish and also have the benefit of making sewing easier. Check out website to see how good this patch really looks when applied to a leather vest. Most of the skull patches available at TheCheapplace.com are truly amazing designs which will draw attention no matter where you go. They are large enough to take up nearly the entire rear of your jacket or vest and will help you to create a dramatic, jaw dropping item of clothing that you will be proud to wear every time you step on your bike. There are many more fantastic designs on this site such as the "Ride or Die Skull Patch". 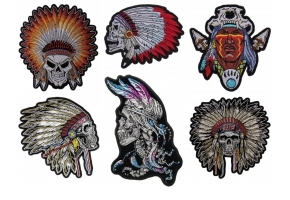 If you are looking for something different that will look incredible on your biker gear then the "Tribal Skull Patch" is definitely a winner. This huge patch will fill the rear of your vest or jacket and the stunning green color will be sure to get people looking your way. To maximize the effect of this truly superb patch, you should apply it to dark clothing so that it stands out in all its glory. Check out TheCheapplace.com to see a whole host of amazing skull patches and how fantastic they look when applied to a leather vest.